Four African artists have been named winners of the 2017 AIR – Bellagio Centre Artist In Residency program. They are Biyi Bandele (Multidisciplinary) Nigeria, Mona Eltahawy (Literature) Egypt, Noo Saro-Wiwa (literature) Nigeria, and Sisonke Msimang (Literature) South Africa.. The residency award is granted to applicants whose work and process align with the Africa Centre and Rockefeller Foundation’s shared goal to catalyze art that progresses the wellbeing of humanity and advances positive social change. The program is a collaboration between the Africa Centre and the Rockefeller Foundation to support mid to late career African artists by offering residency opportunities at the Foundation’s Bellagio Center in Italy. 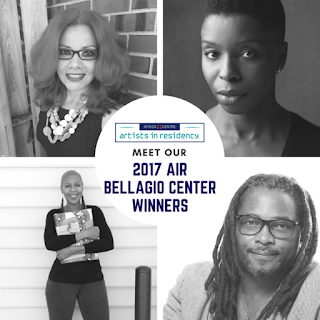 Applications for the 2018 Artists In Residency Program will open on July 1st, 2018.